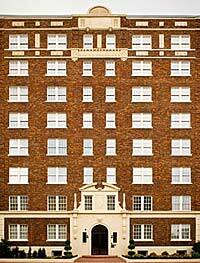 This Washington Suites hotel was built in 1926. The Eldon Luxury Suites Hotel is part of an on-going revitalization of that section of the city. A historically restored dc hotel with granite floors, custom Birchwood walls, side shower massage jets, and luxury fully equipped, full-size kitchens with granite counter tops. A Washington Suites hotel perfectly geared for those who are looking for the best that hotels have to offer, with something beyond the impersonal hotel feeling.